Evidently pumpkin is native to North America, but has spread across the world and adapted to the cuisine of every region. You can eat the flesh, the seeds, the flowers, and even the leaves. Pumpkin flesh is super nutritious - high in vitamin A and fiber. It's very filling, and is great for vegetarian main courses. 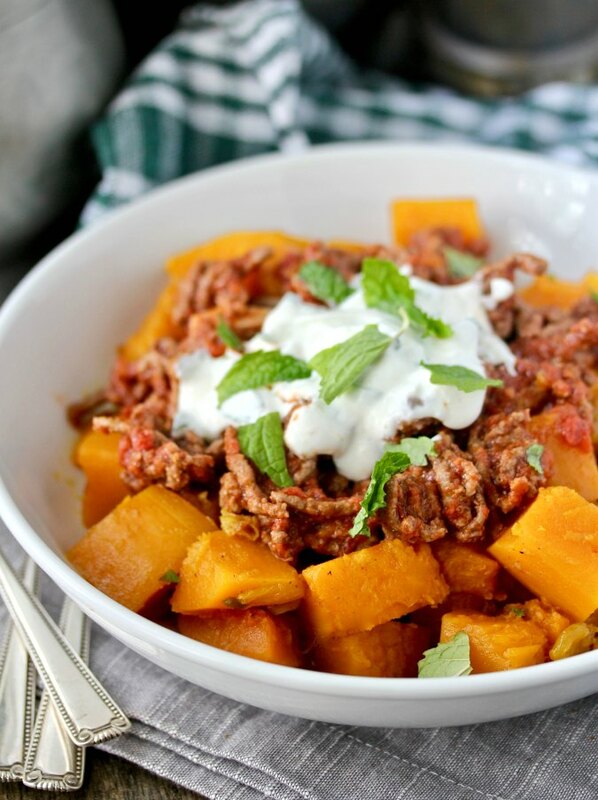 There are so many flavors in this Afghan style pumpkin recipe. Onions, turmeric, ginger, jalapeño, garlic, coriander, tomatoes, and mint come together to create a wonderful savory dish. While giant pumpkins might be fun to grow, for a more flavorful dish, use smaller pumpkins, particularly sugar pumpkins, which are usually available in the fall. 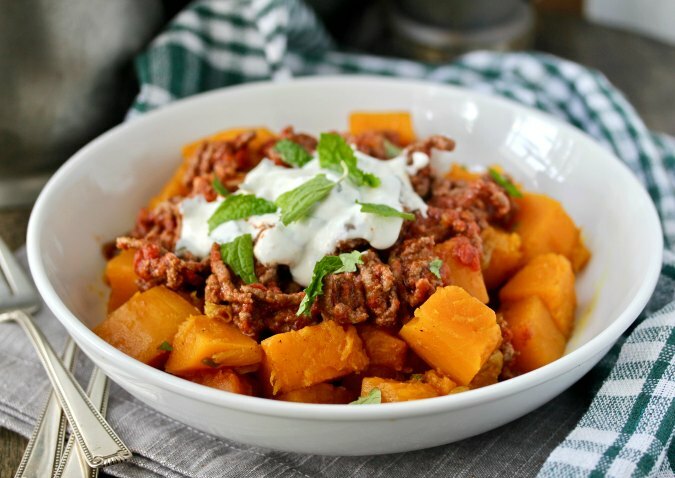 You can also make this dish with other winter squash, such as butternut. 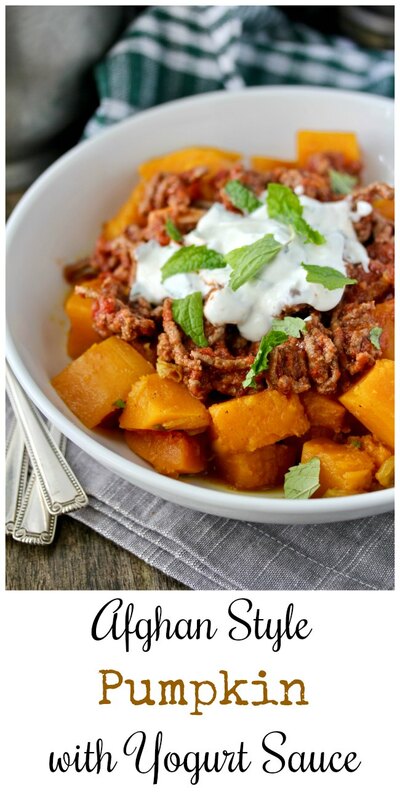 You can also make this dish vegetarian by eliminating the beef and using vegetable stock to cook the pumpkin. Just double the tomatoes if you eliminate the beef. Our inspiration this week is the chapter, Pumpkin +3 Ways. There are three international style dishes: Risotto con la Zucca, Moroccan Style Pumpkin with Lentils, and this Afghan style pumpkin. I pretty much stuck with the recipe because it sounded so interesting. More pumpkin recipes from my fellow participants. Heat the oil in a large saucepan over medium high heat. Add the onion and cook for about 10 minutes, until lightly browned. Add the turmeric, ginger, and jalapeño and cook for 2 minutes more. Add the pumpkin, stock, salt, and pepper. Bring the mixture to a boil and then cover and reduce the heat to low. Simmer until the pumpkin is tender, approximately 20 to 30 minutes. Stir occasionally. Remove the lid and, if necessary, boil the mixture until the broth is thick. Season with more salt and pepper to taste as needed. In a separate skillet, heat the olive oil over medium. Add the crushed garlic, ground beef, and salt and pepper. Cook the mixture, breaking up the beef, until it has begun to brown. Add the tomatoes and coriander. Over low heat, simmer for 5 to 10 minutes. In a separate bowl, stir together the yogurt, mint, minced garlic, salt, and pepper. Top the cooked pumpkin with the tomato beef mixture, and then the yogurt sauce. Garnish with more mint. Wow I'm loving this dish a lot! We eat pumpkin/winter squash a lot here so I'm always looking for new and delicious ways to use it. Pinning and trying soon! This is a great savory recipe. Thanks Amy! I bet lamb would be delicious. I'm sure that's why they call it "Afghan style," ha ha. This is a delicious dish and kind of different. Hope you like it!